This is a rare photo of the first version of CLEOPATRA starring Elizabeth Taylor in the titular role. 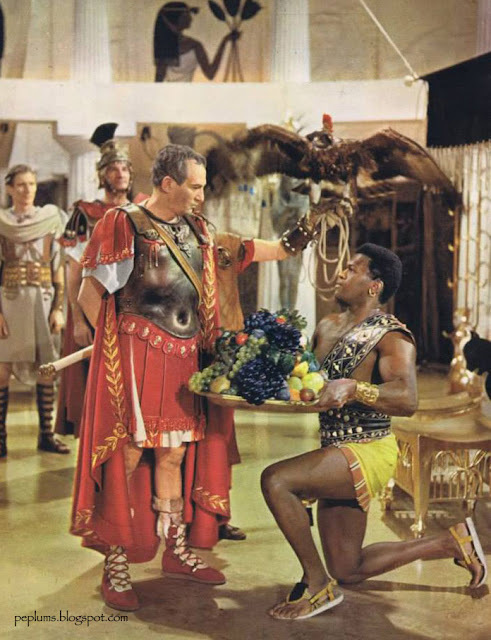 In this staged photo we see Peter Finch as Julius Caesar and Harry Baird as a servant. As this production started in 1960, this would have been Baird's first PEPLUM role. Unfortunately, when the first version of CLEOPATRA was scrubbed and production moved to Rome, Baird and Finch didn't reprise their roles.